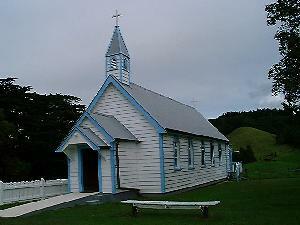 Bishop Pompallier was particularly revered by the Maori people of Hokianga and elsewhere. He had brought Catholicism to them, was sympathetic to their concerns and had an enlightened attitude towards Maori culture. Bishop Pompallier returned to France in 1869 after thirty years of missionary work in New Zealand. He died in 1871 and was buried at Puteaux near Paris. Almost unknown in France, or rather forgotten, because of his long absence from his homeland, his grave was nevertheless visited by travellers from New Zealand. During the 1990s many voices began to call for the return of the founding Bishop. The Taitokerau Regional Pastoral Council led the way, and in 2001 the New Zealand Catholic Bishops announced that the dream would be fulfilled, thanks to the consent and cooperation of the Pompallier family and the Bishops of France. On April 20, 2002 a large gathering of bishops, clergy, religious and laity saw the reinterment of the Bishop’s coffin beneath the altar in St Mary’s Church, Motuti. Among those present were bishops from New Zealand, France and the Pacific Islands, the great-grand-niece of the Bishop, the Maori Queen Te Arikinui Te Atairangikaahu, the French Ambassador to NZ and representatives from many sectors of church and society. The marae is the community home and the people of Motuti gather at the Marae regularly. The community supports, nurtures, feeds, and teaches the next generation – visitors are welcomed and become part of the whanau. There have been two marae at Motuti, the first belonging to a local whanau and the second the Motuti Parish Hall, built in 1936. Motuti Marae was completed 20 years ago after many years of community effort. 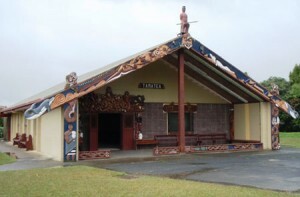 Visitors to Motuti Marae learn traditional weaving, poi-making, waiata (songs), haka (traditional ‘dance’ or challenge) kemu (stick games) and bone and wood carving. Carving is a significant cultural tradition for Maori and the Maori carvings in the whare hui - meeting house represent the different tupuna – ancestors – and relate the history and stories of the Hokianga Harbour.